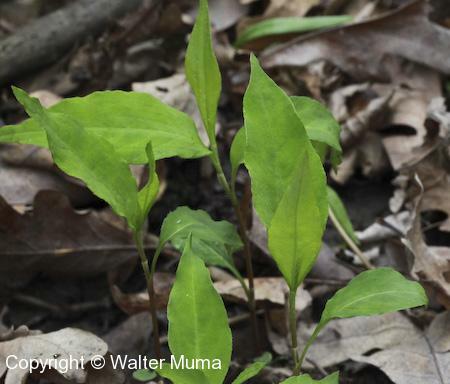  Lady's Thumb (Persicaria maculosa) - Leaves also have a splotch in the middle, but the plant is much smaller and the flooweres are quite different. Flowers: Summer; White; 4 parts (petals); Very small flowers. 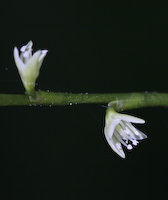 Photography notes: Jumpseed flowers are very small and are difficult to photograph. And it doesn't help that they're located along a very lon flower stalk that bounces in the slightest breeze. Photographs: 88 photographs available, of which 7 are featured on this page. SCROLL DOWN FOR PHOTOGRAPHS. Jumpseed flowers are very small! Another photo of a flower. Jumpseed flower stalk, with flowers and developing seed pods scattered along its length. 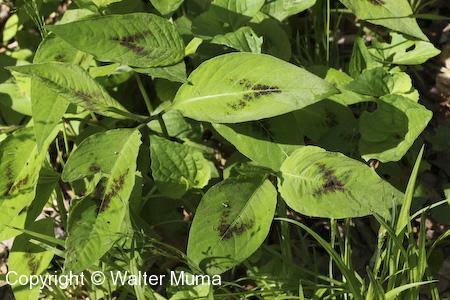 Jumpseed has distinctive leaves, sometimes with a large splotch in the middle. Jumpseed plants just coming up in the spring. 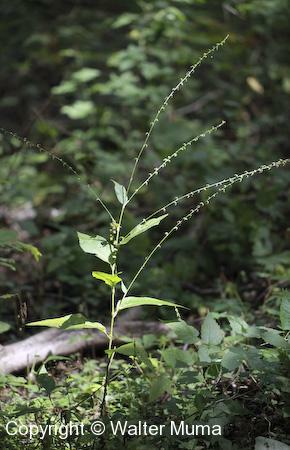 An entire Jumpseed plant, with leaves and the long flower stalks.